KaloBios Pharmaceuticals (KBIO) is a biopharmaceutical company based in San Francisco, CA, focused on the development of monoclonal antibody therapeutics. KaloBios's business strategy involves in-licensing antibodies, typically from academic institutions, and developing Humaneered™ antibody versions through clinical proof-of-concept studies. The company aims to out-license these technologies to big pharmaceutical/biotechnology companies for further clinical development and commercialization of the products. Alongside this strategy, KaloBios intends to retain the rights for specific antibodies targeted at specialty or orphan indications. KaloBios's lead program, an anti-PcrV of Pseudomonas (Pa) mAb, is in an ongoing Phase II study for treatment of Pa infections in CF patients. Sanofi Pasteur (SNY) licensed this antibody for treatment ofPa-related pneumonia in hospital acquired infections, and holds an option to license the cystic fibrosis program as well. The company's anti-GM-CSF mAb for treatment of severe asthma, currently in mid-stage clinical development, holds great potential value for the company. Industry statistics suggest that mAb programs command high premiums upon commercialization, mainly due to higher clinical development success rates and reduced exposure to generic competition. KaloBios's pipeline is diverse and based on a robust technologic platform that can deliver future pre-clinical programs. On Jan. 31, 2013 KaloBios completed an initial public offering of its stock in the Nasdaq stock exchange, which generated gross proceeds of $70 million. Considering the planned clinical development activities, the company's net cash should be sufficient for at least 2-3 years. KB001-A: First-in-class anti-PcrV of Pseudomonas aeruginosa (Pa) for treatment of cystic fibrosis patients with chronic Pa infections. KB003: Anti-GM-CSF antibody for treatment of severe asthma inadequately controlled by corticosteroids. KB004: First-in-class anti-EphA3 for treatment of hematologic malignancies. In addition, KaloBios holds an agreement with Sanofi Pasteur for the development and commercialization of KB001-A for hospital-acquired Pa-related infections. Sanofi's initial targeted indication is prevention of Pa-related pneumonia in mechanically ventilated patients. KaloBios's valuation was implemented using the "pipeline" method that is suitable for the developmental stages of most of the company's products. The company's valuation is conducted by examining the company as a holding entity vis-à-vis existing projects, with risk-adjusted net present value (rNPV) capitalization to the net present value, including weighting of several scenarios. We analyzed KaloBios's pipeline, unallocated costs and non-operational assets/liabilities as of Feb. 26, 2013, at an equity value of $235.8 million and price per share of $10.1. Clinical programs KB001-A: Anti-PcrV of Pseudomonas aeruginosa for treatment of Ventilator-Associated Pneumonia (out-licensed to Sanofi). Pseudomonas aeruginosa (Pa) is an opportunistic gram-negative bacterium, commonly associated with hospital-acquired infections, most notably in immune-compromised individuals. Morbidity and mortality due to Pa infection are dependent on a combination of host factors, the severity of tissue injury, and the intrinsic resistance displayed by Pa to many therapeutic drugs. Individuals with compromising conditions, such as HIV/AIDS, cystic fibrosis, chemotherapy-related neutropenia and diabetes, have an increased risk of acquiring an infection and developing complications. Pa accounts for 10% of all nosocomial (hospital-acquired) infections. This bacterium is the fourth most commonly isolated nosocomial pathogen, and the second most frequently recovered pathogen from intensive care unit patients. Pneumonia accounts for approximately 15% of all hospital-associated infections and a quarter of all infections acquired in intensive care and coronary care units. Granted orphan drug designation in the US and EU. Phase III expected to initiate in 2H 2012. Passive vaccine based on antigens derived from two outer-membrane proteins from Pa.
Co-financing of the program with Novartis. First interim data expected in 2H 2013. Cubist Pharmaceuticals is in late-stage clinical development of an intravenous antibiotics combination: Ceftolozane - a proprietary novel cephalosporin, and Tazobactam - a generic beta-lactamase inhibitor. In addition to the Phase II study performed in Pa-related VAP patients, this combination is currently tested in two Phase III studies for other hospital acquired infections. Other than KaloBios, two companies are developing immune-related therapies for Pa-related VAP: Kenta Biotech with an anti-lipopolysaccharide (LPS - a major component of the bacterial cell wall) Ab, and Intercell with a passive Pa vaccine, which is developed under an agreement with Novartis (NVS). KaloBios and Sanofi are lagging behind the three competitors; however, the small number of pipeline technologies and major unmet clinical need make this therapeutic area wide open for more than one solution. Additionally, we see KaloBios's relative advantage by the partnering agreement with a big pharma player. The valuation of KB001 (Pa) is a risk-adjusted net present value (rNPV) capitalization to the net present value. The valuation includes weighting of several scenarios, based upon main assessments described above. The valuation parameters are summarized in table 2. Given the aforementioned parameters, we estimate the total value of this program at approx. $38.1m. Cystic fibrosis is the most common lethal inherited disease among Caucasian populations. The genetic background of the disease is related to over 1,500 mutations in the transmembrane conductance regulator (CFTR) gene on chromosome 7, which lead to malfunction of the chloride channel, and resulting in impaired function of exocrine glands. The disease affects multiple organs, including the airways, pancreas, small intestine, liver, reproductive tract and sweat glands. Clinical symptoms of CF consist of viscid mucus, respiratory infections, intestinal malabsorption of fat, diabetes mellitus, impaired liver function, male infertility and salt loss. Pulmonary involvement occurs in 90% of CF patients, with end-stage lung disease being the principal cause of death. CF is characterized by thick and sticky lung mucus combined with impaired clearance of the mucus by cilia - the lungs' non-inflammatory defense mechanism. This leads to clogging of the airways, causing breathing problems, facilitating growth of bacteria and impairing bacterial clearance. The prevalence of CF is approximately 30,000 individuals in the US and 70,000 worldwide. In the US, each year, one in three Patients with CF is hospitalized, mostly for treatment of "pulmonary exacerbations" caused by an infection and requiring treatment with antibiotics. According tomarket research by Global Industry Analysts, the size of the global CF market was $1.1 billion in 2010. KaloBios develops KB001-A for treatment of Pa-infected CF patients for reduction of the Pa pathogenicity and supporting the bacterium's clearance by the body's immune system. KB001-A may be used both as a preventive treatment aimed at reduction of Pa-related pneumonia in CF Patients, and as a treatment for patients already suffering from Painfection. Reduction of Pa-induced inflammatory processes may improve long-term lung function in CF patients and reduce subsequent morbidity and mortality. Drugs in clinical development for Pa infections in CF patients are divided into two families: antibiotics and anti-inflammatory agents (table 3). Developed for prevention of Painfection recurrence. The valuation of KB001-A is a risk-adjusted net present value (rNPV) capitalization to the net present value. The valuation includes weighting of several scenarios, based upon main assessments described above. The valuation parameters are summarized in table 4. Given the aforementioned parameters, we estimate the total value of this program at approx. $24.2m. Asthma is a chronic inflammation of the bronchial tubes (airways) that causes swelling and narrowing of the airways, resulting in breathing difficulties. The bronchial narrowing is usually reversible with treatments. Bronchial tubes that are chronically inflamed may become overly sensitive to allergens or irritants. The airways may become "twitchy" and remain in a state of heightened sensitivity. Severe asthma is a debilitating form of asthma which afflicts between 5% and 10% of asthma sufferers. Severe asthma can develop in childhood, often in association with allergies, or come on later in life in relation to respiratory infections, hormonal changes or environmental exposures. Asthma affects 5-10% of the population, which translates to over 23 million persons in the US (including 7 million children) and 300 million individuals worldwide. The number of global asthma patients is expected to rise to 400 million by 2025. Approximately 5-10% of patients have severe persistent asthma. The global asthma therapeutics market was valued at $14.4 billion in 2010, and is forecasted to grow at a compound annual growth rate of 4.6% over the next eight years, to reach $20.6 billion by 2018. The asthma therapeutics market has shown high growth during 2005 to 2010 due to the growth in the patient population, as well as the preferential uptake of novel products such as Advair/Seretide and Symbicort. KB003 is a human IgG1κ antibody targeting the human Granulocyte Macrophage Colony Stimulating Factor (GM-CSF) protein. KB003 neutralizes the activity of GM-CSF, which, when overexpressed, contributes to sustained inflammation in several pathologies. Neutralization of GM-SCF may attenuate such pro-inflammatory processes. The company has recently initiated a 150 patient, randomized, double-blind, placebo-controlled, monthly intravenous dose, Phase II clinical trial in adults with severe asthma inadequately controlled by corticosteroids. The Asthma clinical pipeline is vast, and composed of several major drug families, such as new long acting β2-agonist/inhaled steroids combinations, kinase inhibitors, anti-interleukin antibodies, inflammatory receptors antagonists, and more. The valuation of KB003 is a risk-adjusted net present value (rNPV) capitalization to the net present value. The valuation includes weighting of several scenarios, based upon main assessments described above. The valuation parameters are summarized in table 6. Given the aforementioned parameters, we estimate the total value of this program at approx. $60.3m. Hematological malignancies (blood cancers) include cancer types that originate in cells of the immune system and affect the bone marrow, the blood cells and the lymph nodes. These diseases result from mutations in the DNA of a single lymph - or blood-forming stem cell. According to the American Cancer Society (ACS), more than 140,000 people were diagnosed with a hematologic malignancy in 2011 in the US (figure 12), and an estimated 400,000 people are living with, or in remission from leukemia and myeloma. The US numbers constitute around 50% of hematologic malignancy patients in the seven major markets. The 2011 leukemia and multiple myeloma therapeutics market was valued at over $8 billion and is expected to reach ~$15 billion towards the end of the decade. 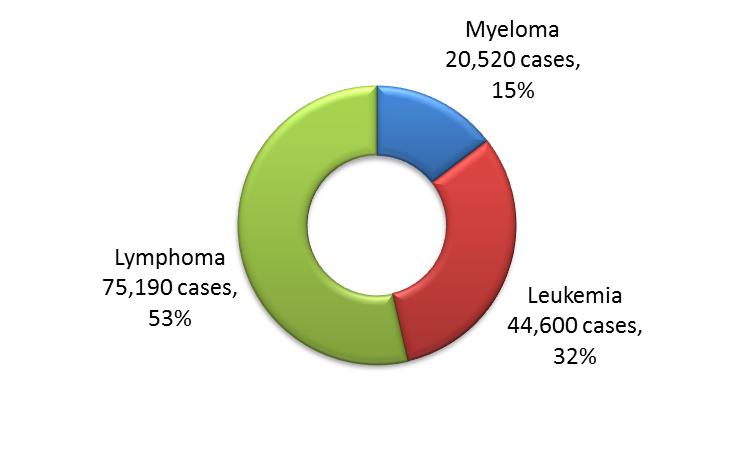 ew cases of Leukemia, Lymphoma, and Myeloma in the US, 2011. Over the last decades we have seen a growing understanding of the subtypes for each blood cancer, and the differences in therapies required for each subtype. KB004 is a first-in-class, Humaneered™, non-fucosylated, monoclonal anti-EphA3 antibody. KB004 can potentially kill tumor cells by either direct induction of programmed cell death (apoptosis), or antibody-dependent cell-mediated cytotoxicity (ADCC) activity, which is enhanced due to the non-fucosylation of the Ab. In addition, KB004 may disrupt the tumor vasculature by binding to EphA3 on the endothelial cells that line it. The valuation of KB004 is a valuation of early stage programs. This ROV method is designated for pre-clinical and early-stage clinical programs/companies where the assessment is binary during the initial stages, and based upon scientific-regulatory assessment only (binomial model of B&S with certain adjustments). We can indicate eight scenarios leading to product launch; each one has its probability, based on clinical trial attrition rates. For example, there is 24% chance for the company to reach the market at 2021 with potential sales of $4.9b with all risks. We assume launch at 2021 until the end of the patent period (2030). Given the aforementioned parameters, we estimate the total value of this program at approx. $17.3m. We conclude our pipeline analysis with total value of $140.0m. The "pipeline" is supported by the company's broad technological foundation. Valuation of the technological basis is actually valuation of the "residual value" of the company. It is assumed that the technology generates projects for n years: in our valuation, and based on the patent period, n=17 years. We therefore subtract from the technologic platform value all projects generated after n years (the exceeding projects). Given the aforementioned parameters, we estimate the total value of this program at approx. $42.5m. 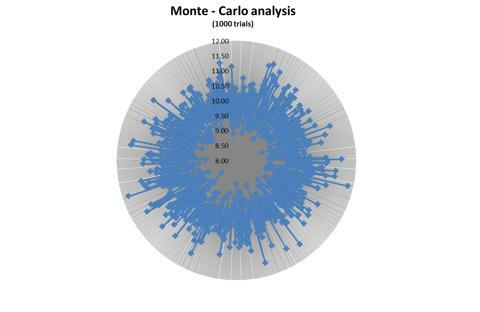 Our financial valuation uses the Monte Carlo Method, which encompasses techniques of statistical sampling employed to achieve approximate solutions to quantitative problems. Essentially, the Monte Carlo method solves a problem by directly simulating the underlying process and then calculating the average result of the process. This very general approach is valid in areas where predictability is involved - namely in the sciences areas. In figure 2 we present stock target simulations in relation to the capitalization rate, which has a dramatic influence on the stock's target price. We set a range of 1% standard deviation (STD) from our CAPM model (as presented in appendix B) as the error range, and set 1,000 simultaneous trials. The average of those trials was $10.1 ± $0.53. Given the aforementioned parameters, we estimate the equity value of the company at approx. $235.8m. With shares outstanding of 23.39m shares, we estimate the share price at $10.1 with standard deviation of $0.53.